After the War of 1812 finally removed the British military threat from Western New York, the area quickly began filling up with settlers. Historical re-enactment of life in the 19th century is an everyday activity at Genesee Country Village in Mumford. 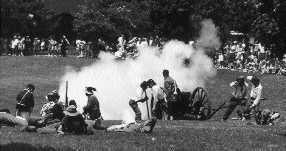 The Civil War weekend occurs in July. After the War of 1812 finally removed the British military threat from Western New York, the area quickly began filling up with settlers. The primeval forest fell to the settler's ax, and villages and cities sprang up in the wilderness. The opening of the Erie Canal in 1825 made Rochester America's first boomtown. Many of the new settlers were foreign-born, immigrants who had borne the brunt of the back-breaking canal construction and others passing through in search of their fortunes in the newly opened lands farther west. Stll, many stayed to power the farms and factories of the growing industial age. The City of Rochester grew around the High Falls of the Genesee River, whose water powered early mills. Rochester became known as the Flour City, with the rich farmland's bounty being floated down river to be processed for market. And rich it was. For a time, the Genesee Country served as the granary of a growing nation. Fruits and vegetables also thrived in the temperate climates near the Great Lakes. Many nursuries and seed houses thrived, filling the needs of farms and gardens nationwide. Soon the Flour City became known as the Flower City. The region remains a prime agricultural area today.